When I initially planned my first trip to Indonesia, I didn’t think I’d make it to Borobudur. I was focused on exploring Bali and worried a flight to Yogyakarta would eat up too many of my precious travel days. I had also heard Java was a bit of a challenge for solo backpackers, and wasn’t sure how comfortable I felt going to Yogyakarta by myself. Then I met a girl named Rahel from Germany, and she told me about her plan to explore Sumatra and see Borobudur on the way. Sumatra is one of the last surviving habitats for wild orangutans, and another epic Indonesia location I thought I’d have to skip this trip. Lucky for me, Rahel and I got along great, and she invited me to go with her! Borobudur is one of the largest Buddhist structures in the world. It consists of nine stacked platforms, and is home to over 500 Buddha statues. In terms of architectural and spiritual importance, it ranks with places like Pagan in Myanmar and Angkor Wat in Cambodia. 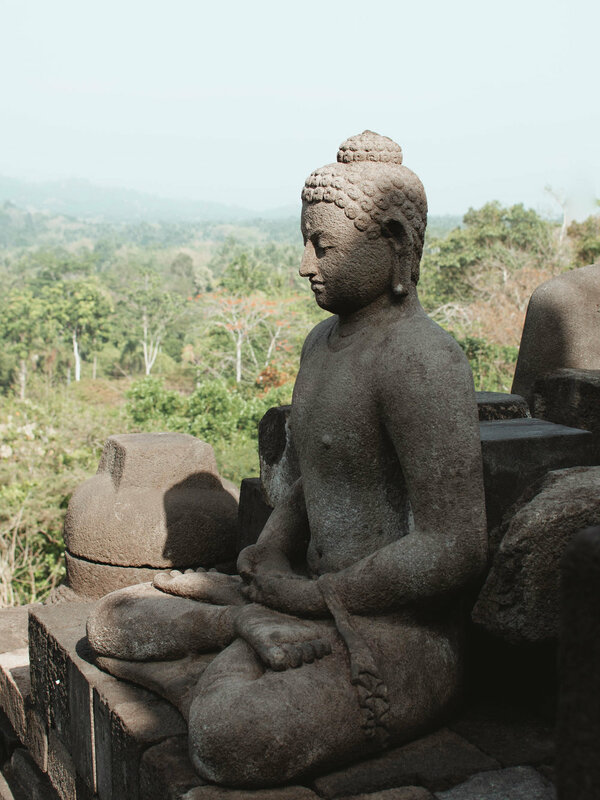 Borobudur is the kind of place which makes you stop and appreciate your surroundings for a change. It is massive, ancient, and overwhelmingly spiritual. Borobudur is about an hour and half from downtown Yogyakarta by car. Yogyakarta is a city in Indonesia on the island of Java. The easiest way to see Borobudur is to fly into Yogyakarta and book a tour through your hostel or homestay. A tour will usually provide transportation to and from the temple from wherever you’re staying at in Yogyakarta. While you can take a taxi to Borobudur without a tour, I found it to be cheaper with a tour because of the shared transportation costs. Borobudur is one of the most popular spots to watch to the sunrise in Indonesia. Before you even leave the airport in Yogyakarta, you’ll likely already have been offered a tour package for the famous temple. If that stresses you out a little bit, don’t worry. Instead of talking to those first few tour operators, check-in at your hostel or homestay and see if they offer a tour to Borobudur. Their tour will likely be cheaper than the ones at the airport, and will be more convenient since you can talk to the reception anytime you have questions. During my visit to Yogyakarta, I stayed at Good Karma hostel and ended up booking my tour though them. The following price and tour information is specific to Good Karma hostel, yet still should be a useful reference to base pricing off of. I ended up going with package A from Good Karma hostel. Initially, I wasn’t sure if I’d regret missing the sunset from inside the temple itself, but I feel like I made the right decision by going to the hill first. Not only was this package a lot cheaper than package B, the view from the hill was gorgeous! We had a wide open view of the surrounding jungle, could clearly see the sun rise above the clouds, and were just able to make out the top of Borobudur in the distance. After 30 or so minutes on the hill, our group made its way to Borobudur - where we still had about 2 hours left to explore the temple. To my surprise, the temple wasn’t at all crowded when we got there, giving me plenty of time to get photos without people in them and to capture the morning light. If you’re looking to see Prambanan temple as well, you can either book it as an add-on to your Borobudur tour, or see it on your own sometime. While I decided not to visit Prambanan, I would’ve gone there for sunset without a tour if I’d had more time. I saw many people go straight from Borobudur to Prambanan, but they looked exhausted. If you have enough time and really want to see Prambanan, consider going back to your hostel or homestay after the Borobudur tour and then catching a taxi to Prambanan later in the day for sunset. There’s a small restaurant on the grounds at Borobudur, but you’ll likely be starving long before your tour group makes it there. Pack a snack the night before your visit so you’ll have something to munch on while the sun comes up. Unless you really have your heart set on being inside the temple when the sun rises, consider watching the sunset from the ‘hill’ instead. It’s much cheaper and offers a completely different viewpoint of the temple and surrounding jungle. Java is much more conservative region of Indonesia than Bali. While Borobudur is a Buddhist temple, the majority of people in Yogyakarta are Muslim and appreciate it when tourists make an attempt to dress modestly. If you didn’t pack any loose-fitting pants, stop by a market and look for baggy cotton ones. I got a cute pair in Ubud for only $4! When you first reach Borobudur, you’ll likely be tempted to start walking the perimeter of the first platform (since your only other option is to climb higher up the stairs - and let’s be honest, no one wants to do that). However, if you’re serious about taking taking photos and want as few people as possible in them, hike to the top first. The upper region of the Borobudur temple is where the famous bell-shaped structures are. I’d love to hear your travel plans in the comments below!